YSU grad Tim Womer loves that line. 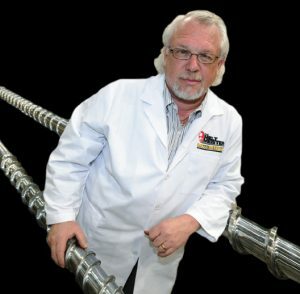 The two-time YSU mechanical engineering technology alumnus is a world-renowned expert in the field of plastics, specializing in the design of industrial-sized extrusion screws. We’re not talking hardware store nuts and bolts. The screws Womer designs, and for which he holds multiple U.S. patents, are too large to fit in a typical business office. Typically composed of metal and ranging in length from 5- to 40-feet, he says plasticizing screws are used to melt and mold plastic to make a wide range of products we use everyday, from water jugs and garbage bags to plumbing pipes and bottle caps. Womer’s 40-year career included a succession of top positions with major plastics companies, most recently as corporate technology officer for the global Xaloy, Inc., until he formed his own consulting firm in 2010. But for founder and president of TWWomer & Associates LLC in Edinburg, Pa., being self-employed doesn’t mean semi-retirement. “The industry won’t allow me to retire,” he says with a grin. “But I’m not complaining. Plastics has always intrigued me. I never get tired of it.” Womer’s phone is always ringing because he is one of only a dozen engineers in the world who can create custom designs for extrusion screws, and he has designed thousands of them. His latest passion, and what he considers the most exciting development in plastics, is 3D printing. Womer has 17 active patents and three that are pending, two of which deal with 3D printing, and his company has a 3D consulting contract with the Oakridge National Laboratory in Tennessee, a massive U.S. Dept. of Energy lab. He helped the Oakridge lab to produce the first 3D printed automobiles for display at 2014 auto shows in Detroit and Chicago. Womer travels frequently in the U.S. and around the world, speaking for technical seminars, lead training sessions and workshops, troubleshooting design and manufacturing problems. “It never stops,” he says. Womer has a long list of awards and honors from the plastics industry, including induction into the Plastics Hall of Fame in 2012. He served as president of the Society of Plastics Engineers in 2006 and won it’s most prestigious honor the following year. After hours, the YSU grad celebrates his German heritage by singing in the Pittsburgh and New Castle, Pa. Maennerchors, and he enjoys outdoor activities such as hunting and chopping firewood. Womer and his wife of 38 years, Barb, are parents of two adult children. Their son, Brock, is also employed as a plastics engineer; daughter Brianna graduated from YSU in May with a doctorate in Physical Therapy and expects to complete an MA in Biology next year.